But I did take a lot of photos! I did manage, in the course of three weeks in New York state, to take a weekend for some time in New York City. It was nice. Very nice, even. Joshua tree, diverged. Photo by jby. Joshua trees, diverged. Photo by jby. 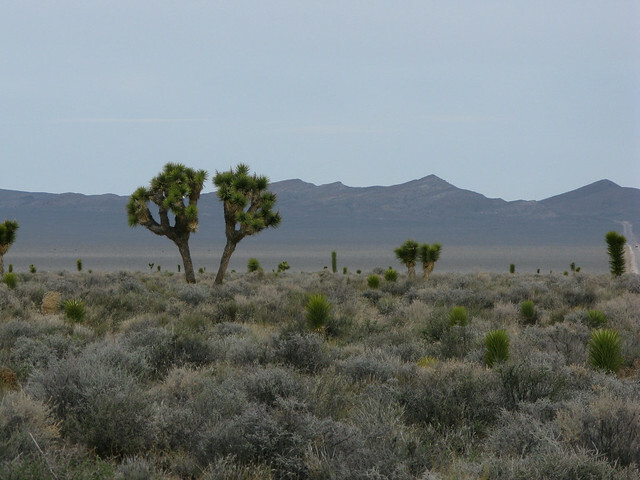 Here’s a photo of two of those different-looking Joshua tree types, side by side in Tikaboo Valley, Nevada. Tikaboo Valley has the distinction of being the one spot where we’ve found both of the tree types, and both of the pollinator moth species, living side by side. 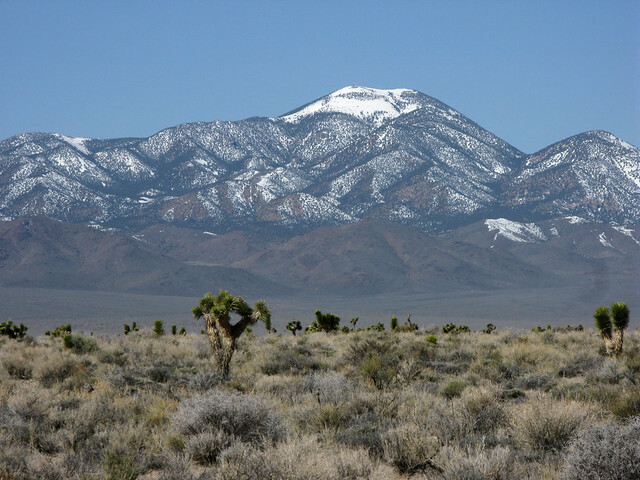 That makes Tikaboo Valley the perfect (well, only) place to figure out whether there’s an evolutionary consequence to the divergence of Joshua tree and its association with two different pollinators. Do Joshua trees make more fruit, or fruit with more surviving seeds, when they’re pollinated their “native” moths? So, over several years of work at Tikaboo Valley, we’ve been edging towards answering that question. We’ve found evidence that, given access to both tree types, the two moth species spend more time on their “native” tree type, and have more surviving offspring when they lay eggs in “native” flowers. But to determine whether plant-pollinator matching matters to Joshua trees, we’d really like to find out what happens when each moth species is forced to use each type of tree, and that’s what Chris has been working on for the last several field seasons. 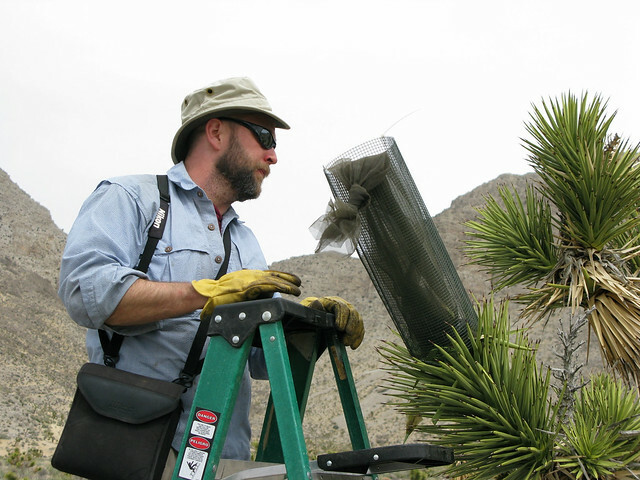 Installing a Joshua tree chastity device. Photo by jby. Open caged flowers, and insert moths. By introducing moths of each species into flowers on each variety of Joshua tree, we’ll be able to see whether trees with the “wrong” moth species are less likely to make fruit than trees with the “right” moth species; and directly verify that moths introduced into the “wrong” tree type have fewer surviving larvae than moths introduced into the “right” tree type. Camp Tikaboo, 2012 edition. Photo by jby. 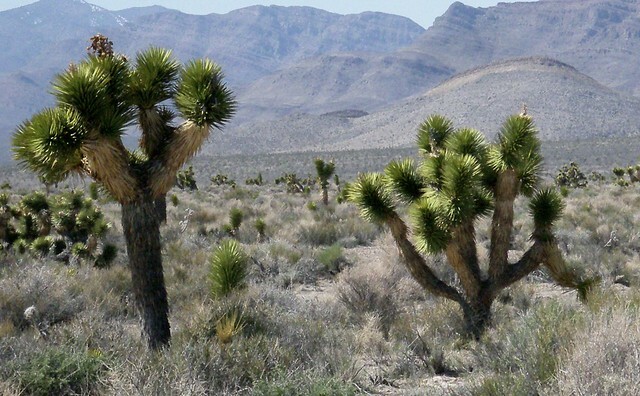 But, being desert plants, Joshua trees aren’t prone to making much fruit even under ideal conditions. After a dry winter (like this last one), it can be hard to find any flowering trees at all. 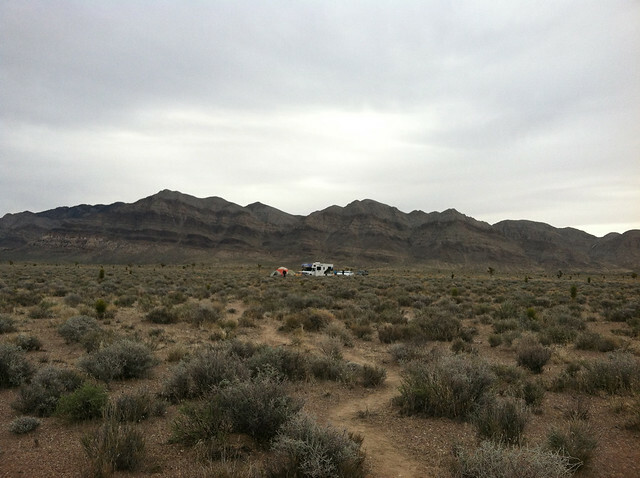 So to obtain a respectable sample size takes a lot of folks—this year, I was one of ten people on the field crew camped in the middle of the valley: a cluster of tents grouped around a rented recreational vehicle, which served as a kitchen/gathering area/lab. In the “war tent,” making plans. Photo by jby. What results we’ll get remain to be seen; this is the second year with a substantial number of experimental trees, and we won’t know whether all that work has borne fruit until Chris returns in a few weeks to see whether any of the experimental trees have, er, borne fruit. As far as I’m concerned, it was wonderful to return to an old familiar field site, in the middle of the desert, and spend a few days hiking around and harassing yucca moths instead of anwering e-mail. But if the experiment works, the results should be mighty interesting. Tikaboo Valley, Nevada. Photo by jby. Well, I’ve successfully run the Seattle Marathon. 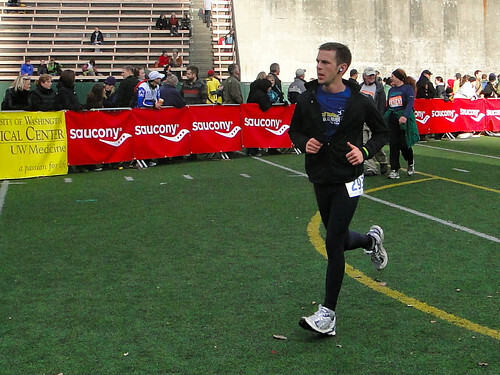 I finished in 3 hours, 31 minutes, and 27 seconds, which is a pretty nice improvement over last time, in Portland. Coming down the home stretch. Photo courtesy my cousin Adrienne. I’ve had a nice hot shower, and my cousin—with whom I’m staying while in Seattle, and who came to watch me cross the finish line—keeps pressing protein-and-vitamin recovery shakes on me, so I’m actually feeling pretty good. It’s great end to a great fall break in Vancouver and Seattle. I took a lot of photos—there’s a slideshow after the jump. 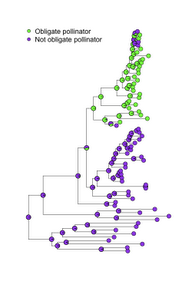 Phylogeny of the Prodoxidae, the family of the yucca moths, with a (very basic) reconstruction of pollinator life habits. 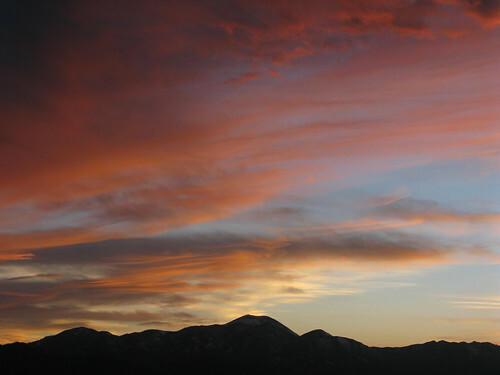 Image by jby. Late last night I made it back to Moscow from (mostly) sunny Santa Barbara, California, where I was lucky enough to attend a summer short course in phylogenetic comparative methods using R, sponsored by NESCent, hosted by NCEAS, and helmed by Luke Harmon and Mike Alfaro. I came into the seminar as a big fan of the programming language R already, and it was great to learn about a whole new range of tools available for the platform. It was even better to learn about those tools in a group of really smart colleagues, all of whom were thinking about how best to use R in their own projects. It was like a warm-up for the Evolution meetings, which start this Friday. 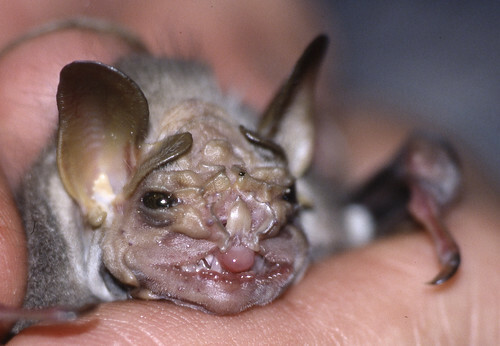 Like the meetings, one of the principal pleasures was learning about everyone else’s study organisms, the best example being the wrinkle-faced bat, which has the strangest trait I think I’ve ever seen in a mammal: a bald face, and a “mask” of furry skin it can pull over said face. Flickr has photos! I’ll put one below the fold in deference to the squeamish. Eat your heart out, George Lucas. Photo by Evets Lembek. 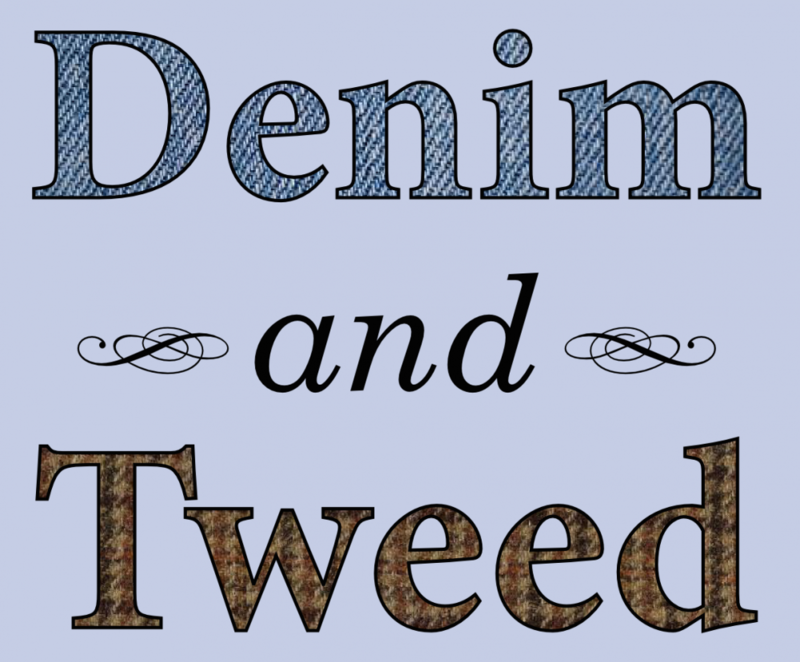 I had two of my first-author manuscripts accepted for publication. One, reconstructing the characteristics of yucca moths before they became yucca moths [PDF], will appear in the Biological Journal of the Linnean Society; the other, a review of what we know (and don’t know) about how ecological processes create adaptive radiation [PDF], will be in the Journal of Evolutionary Biology. Needless to say, I’m very pleased. I’ll discuss each paper in more detail when they’re posted to the respective journal websites. The 2010 Research Blogging Award winners were announced—congrats to Ed Yong at Not Exactly Rocket Science, who took Best Blog, Best Post, and Best Lay-Level Blog; and to Bora Zivkovic at A Blog Around the Clock, who took Best Biology Blog and Research Twitterer of the Year. The Daily Monthly blew through its second topic, world population, and is now well into a third, fitness. Andrew Sullivan is calling for the Pope to resign. Slacktivist is almost forty pages deeper into Tribulation Force. I’ve got a lot of catch-up online reading, in other words. Apparently the revolution finally came, and we are now living in a socialist worker’s paradise in which pre-existing conditions are illegal and 26-year-olds can use their parents’ health insurance. I, for one, am totally excited to get my new Mao jacket. Yeah, it was worth it. Photo by jby. 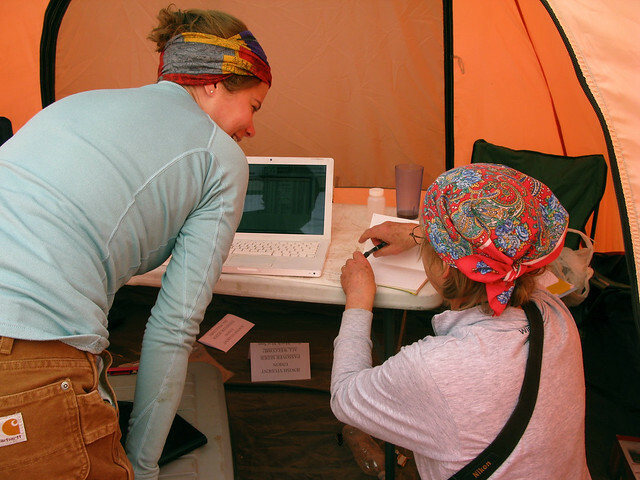 So another field season came to a close Friday, and after a 1,000-mile drive from Nevada, I’m in Salem for the week, tying up loose ends and getting ready for the Evo-WIBO 2010 meeting next weekend. I’ll probably write up something in greater detail—and announce D&T’s first special series of posts—in the next few days, but for now, here’s my final set of field season photos. Getting serious mileage out of the new camera! Posting this from the Las Vegas airport wifi, so my photos will have to speak for themselves. My inbox is packed!